Hi there! Happy Monday! I hope you all had a great weekend! I'm really excited to be partnering with some amazing bloggers for a little giveaway today. But first, let me take a selfie let me tell you about some of my favorite travel accessories as of late. I'm sure you could tell by Insta/Twitter I've been bitten by the travel bug as I spent this past weekend in DC, the one before in Chicago and this coming weekend I'm headed off to Philly for a quick trip. When traveling, there are some essentials I make sure I pack in my bag to stay organized, pretty and clean. My GiGi New York clutches are always perfect for keeping my tote bag organized and it doubles as a bag option while traveling. My newest favorite travel companion, my Well-Kept tech wipes, keep my phone, laptop and sunglasses all clean (with just one cloth!). Next, I can't forget my Yosi Samra flats since they tuck away so nicely and lastly my LAQA & Co lip colors keep my pout colored at a moments notice. So here's the fun part you've been waiting for - the giveaway deets! 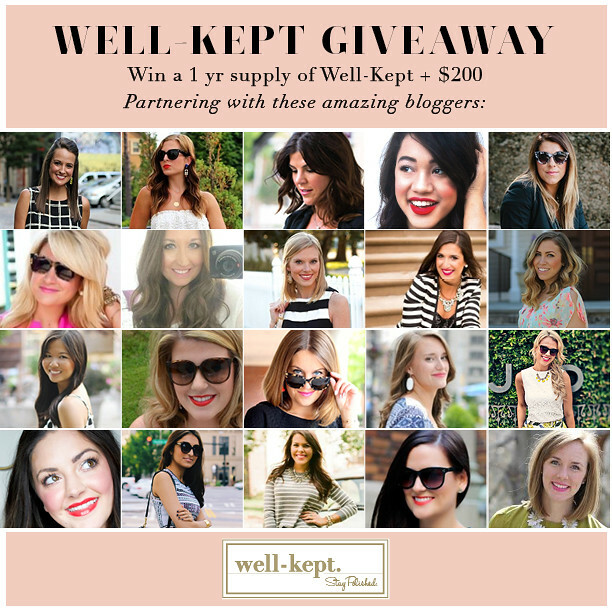 I'm teaming up with Well-Kept and the bloggers below to give you a $200 American Express giftcard and a year's supply of Well-Kept wipes! There will be 1 winner, which will be announced by Well-Kept on September 30th. Enter this giveaway via the Rafflecopter widget, and you can unlock more entries if you complete the ones below.